With another year comes another version of iLife (or something like that), and this year we’ve been treated to iLife ’11, which consists of major updates to iPhoto, iMovie, and GarageBand. iPhoto ’11 was announced at the recent ‘Back to the Mac’ event and has a number of intriguing new features that make it a pretty big update when compared to iPhoto ’09, so let’s take a look at what Apple has to offer. It seems that Apple is introducing quite a bit of full screen compatibility into its applications; it plans to launch Mac OS X 10.7 with some more full screen functions, so this seems like a logical step to take. Although it may not seem like a huge deal, the extra full screen modes in the new version of iPhoto really help when you need to concentrate or make the most of a small screen size on your laptop, especially now the 11″ version of the new MacBook Air have been released. Full screen mode can be accessed by clicking the “Full Screen” button in the bottom left hand corner of the main window. You can do most of the things in full screen mode that you can do in regular mode. It is mainly focused on viewing photos; you can switch between ‘Events’, ‘Faces’, ‘Places’, ‘Albums’, and ‘Projects’ when viewing your photos. 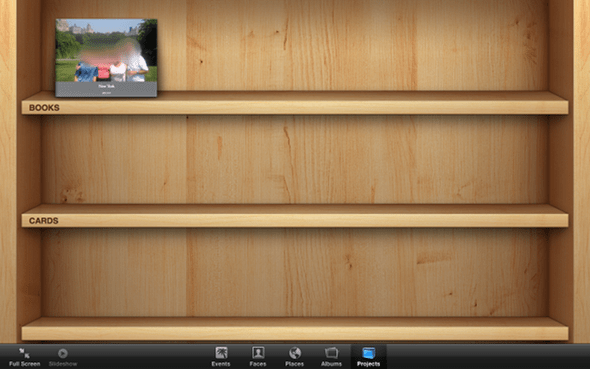 The projects view is entirely new to iPhoto ’11, offering an iBooks style bookshelf with all of the books and cards that you have created, or are in the process of creating. The best part of full screen mode for me personally, however, is the ability to edit your photos without leaving full screen. The editing pane will slide out from the right hand side of the screen, and from the same pane you can also view information about the picture, such as geo tagging and what device took the picture along with the size and resolution. Apple and Facebook may not see eye to eye where iTunes 10 and Ping is concerned, but they certainly seem happy enough to integrate the popular social networking service in to iPhoto ’11. 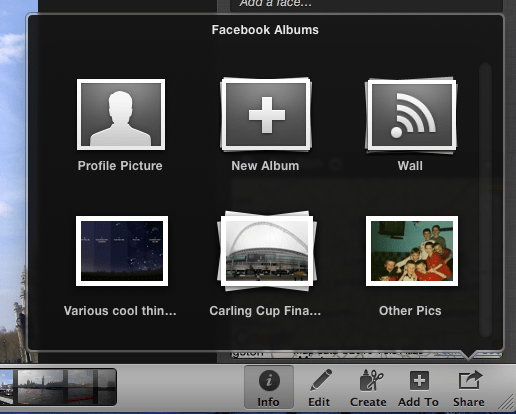 Some basic Facebook integration always existed in iPhoto, but this has been extended further in the recent version, with the addition of being able to select which album the photos are uploaded to, and the ability to create a new album as well. All of this integration is available directly in iPhoto, without any need to access the Facebook website, or any extensions of it, at all. Simply select a photo, several photos, or an album, select the ‘Share’ button in the bottom right hand corner and share via Facebook. Couldn’t be simpler, and it’s a welcome addition. If you’re the kind of person who likes to come back from holiday and share photos on the big screen with family and friends, then you may be impressed with the new slideshows that come packed with iPhoto ’11. You can select an event or album, click on the ‘Slideshow’ button and sit back and relax once you’ve selected your theme and music. One of the slideshows I tested was the “Places” theme, although I was a little baffled that I had to wait a few minutes for the maps to download; I assumed it would be with the installation, but it appears that this doesn’t take long after you’ve already used the theme once. 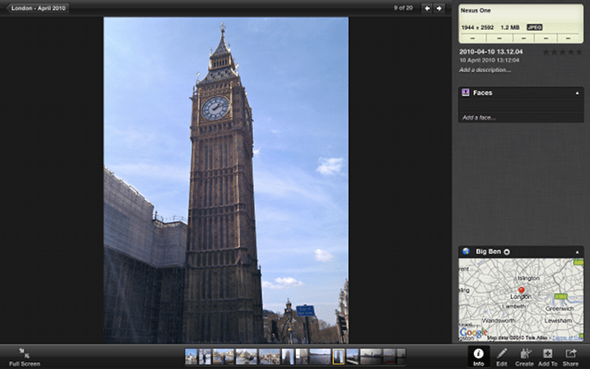 All in all, iPhoto ’11 is a nice addition to iLife, with some neat addition and feature improvements. The Facebook integration is sure to be a hit with users, and although I don’t like some of the other small changes that Apple has made, such as three finger swipes on the multitouch Macbooks not going back to the previous page but the previous photo in grid view, it’s still worth an upgrade for users who spend a lot of time in the application. iPhoto ’11 is part of iLife ’11, which you can get from Apple for £45.